“The C-47, also called Dakota or Skytrain, U.S. military transport aircraft that served in all theaters during World War II and continued in service long afterward. It was used to haul cargo, transport troops, drop paratroops, tow gliders, and as a flying ambulance. The C-47 was a military adaptation of the Douglas DC-3, a twin-engined low-wing monoplane with retractable landing gear that quickly dominated the infant commercial airline industry from its first appearance in 1935. With war clouds gathering over Europe, the Army Air Forces ordered military versions of the DC-3 in 1939, and the first of these, the C-53 Skytrooper, entered production in October 1941; some 250 were produced. The definitive military version was the C-47, with a reinforced fuselage, stronger cabin floors for heavy loads, large doors in the rear fuselage for loading cargo and dropping paratroops, and more-powerful engines. The C-47 entered production in January 1942, and more than 10,000 were manufactured before production ceased in the summer of 1945. Powered by two 1,200-horsepower Pratt & Whitney radial engines, the C-47 had a wingspan of 95 feet (29 meters), a length of 64 feet 5 inches (19.6 meters), and a crew of three (pilot, copilot, and load master or navigator). It had a cruise speed of 155 miles (250 km) per hour and a range of 1,600 miles (2,600 km). The C-47, designated R4D by the U.S. Navy and Dakota by the British Royal Air Force and other English-speaking forces, was produced in many versions. Some were VIP transports, and a few had sleeping accommodations, but the vast majority were fitted with metal bench seats for 28 fully armed troops. The normal payload was 5,000 pounds (2,300 kg), but the C-47 could carry as much as 6,000 pounds (2,700 kg) or even 7,000 pounds (3,200 kg) in an emergency. The spacious rear-fuselage cargo doors could accommodate jeeps, light trucks, or anything else of equivalent bulk and weight, and they could be opened and closed in flight to drop troops or cargo by parachute. This latter capability and its spacious cabin made the C-47 far and away the best paratroop delivery aircraft of the war. Finally, the C-47 could tow two CG-4 Waco assault gliders or one of the larger British Horsa gliders. As an aerial ambulance, the C-47 could carry 18 stretcher cases and a medical crew of three. C-47’s dropped U.S. and British paratroops in North Africa, Sicily, the Normandy Invasion, the Arnhem operation, and the crossing of the Rhine. Of these operations, the most spectacular and significant took place on the eve of D-Day (June 6, 1944), when more than 1,000 C-47’s were involved in dropping U.S. and British paratroops and towing assault gliders to areas behind the beachheads. C-47’s also were used to insert British and U.S. troops behind Japanese lines in Burma (Myanmar) by glider, and they were used for paratroop drops in the Pacific as well—notably on Corregidor Island in the Philippines. More mundane, but probably of greater importance, was the use of C-47’s to haul urgently needed personnel and supplies, including fuel and munitions, in all theaters of the war, giving Allied commanders a logistical flexibility that their Axis opponents could not match. In his memoirs, General Dwight Eisenhower cited the C-47 as one of the most important instruments of victory over Nazi Germany. Until the debut of the four-engined Douglas C-54, which did not enter service until 1944, the C-47 was the most capable transport aircraft of World War II. Beyond doubt it was the most versatile operationally and the most important strategically. Ironically, the most capable all-around Axis transport aircraft of the war was the Japanese navy’s L2D3, a military version of the DC-3 that was manufactured under license in Japan from data purchased from Douglas Aircraft in 1938. The C-47 was a forgiving aircraft, easy to fly and easily maintained under primitive field conditions. 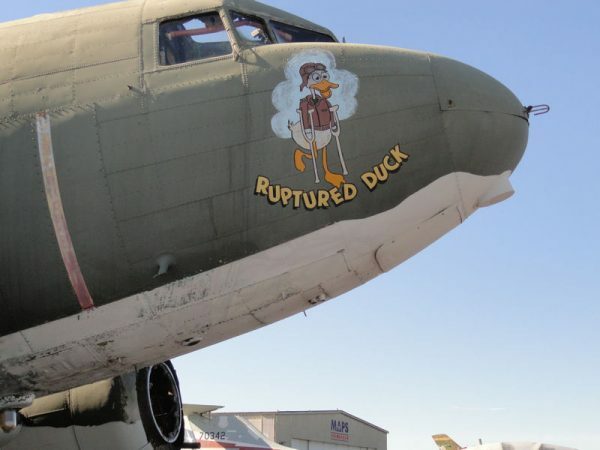 Many aircrew and passengers owed their survival in crash landings to its rugged construction, and its resistance to battle damage was legendary.